Snakes like this one are enjoying the view from Jose Rizal Park these days. Photo by Garrett and Kitty Wilkin. The other day we saw the results of three local restaurant/food service inspections from June 30, and noticed that every single one had zero violations: El Centro de la Raza, the Beacon Avenue Shell Food Mart (this was a big improvement over last time), and… Culinary Communion? I thought they were gone. Tuesday, August 4, is the annual Night Out against Crime. Local groups typically schedule block parties for that evening, and everyone gets out to meet the neighbors. Want to set up a block party? Find out more and register here. Anyone missing a corn snake? 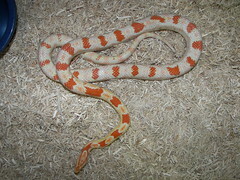 Shannon P. on the mailing list wrote that the owner of a four-foot corn snake found last week (and reported in the Daily Weekly blog) has yet to turn up. 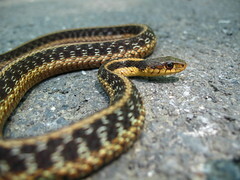 The snake was found near 12th & Massachusetts. Do you know anyone missing a snake? Let us know and we’ll put you in touch.